Protective spray for use on inkjet prints - fast drying and non yellowing. This item is only available for pick up from our office. It is an aerosol based product and no courier will accept it without hefty surcharges. 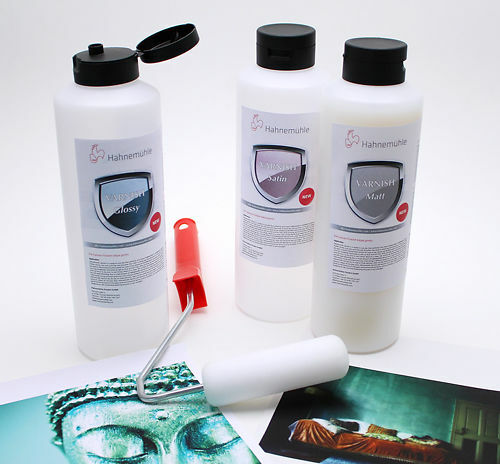 The Hahnemuhle Protective Spray offers good protection for your valuable ink-based images. This odorless spray seals the printed surfaces and protects them from dirt, fingerprints and moisture. It increases the water-resistance of printouts and protects images from fading caused by UV rays. The protective spray is fast-drying and does not turn yellow. It is completely transparent and has no influence whatsoever on the original colors of the paper. Hahnemuhle Protective Spray has been extensively and independently tested and carries the Wilhelm Imaging seal of approval. Of course only an actual test can determine what exact affect a particular coating will have on a print made with a particular paper and ink combination. However we've used this coating here on most popular paper/ink combinations with no problems. With the myriad of benefits and low cost, it seems a very sensible investment in the protection of your art. 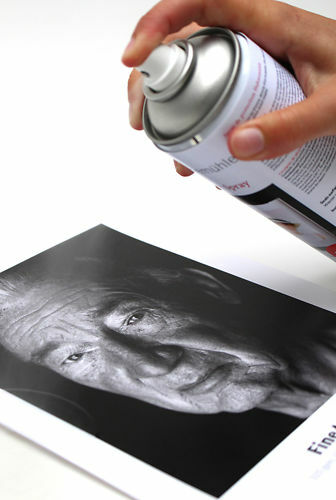 To apply the product, spray in a zigzag direction across the print from about 25-30cm away. A light coating is all that is required. You may see a mottling on your print for a few seconds before the coating dries, after which it should be perfectly clear. Repeat twice more, each time alternating the direction of the zigzag for best results. One tin will coat quite a few prints, perhaps up to 40 A3 prints (2-3 coats each), but of course 'your mileage may vary' depending on your spray technique. Please use the spray only in a well ventilated area (outdoors is perfect! ), and follow all the safety directions on the can (specifically, only apply in a well ventilated area!). Hand curated articles, links and downloads to help you get the best from your Hahnemühle Protective Spray. Protective coating for use on canvas prints - available in matte, satin and gloss finishes.